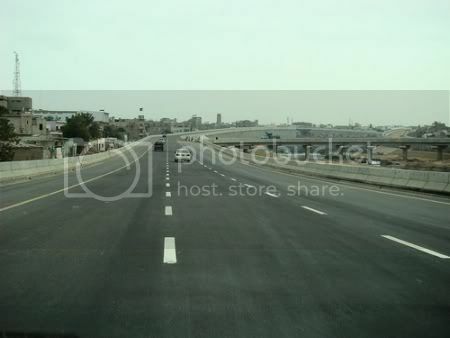 The famous Lyari Expressway project is now open. Atleast in half. The proposed project called for a 4-lane expressway on either side (2-ln each side) of Lyari river. The South bound corridor is now complete and it was inaugurated today (Feb 11, 2008). It is however, not open for general public yet, which is expected to happen in next few days. The total length of Lyari Expressway, North and South bound combined, is 32.155 km. Out of this, the 16 km long Southern Corridor was inaugurated today. This Southern Corridor consists of 8 bridges and 2 interchanges located at the Gharibabad Graveyard on Sir Shah Suleman Road and Love Lane Bridge in Garden West. Following is the Route Map of the Project. Note the location of two interchanges (in red ovals) besides the entrance and exit terminal points. The highway marked as RCD highway (N25) is actually part of the Karachi Northern Bypass (M10). National Highway Authority (NHA)‘s website shows the project start date of Lyari Expressway as May 11, 2002 and completion date of June 30, 2008. NHA website also shows work on Northern Corridor 59% complete and Southern Corridor 100% complete. Cost of Lyari Expressway project was originally estimated at Rs 5.1 billion but now it is expected to cost Rs. 8.227 billion when completed. Another 5 billion rupees have been spent in the resettlement of the people, which brings the total cost of the project to approximately Rs 13 billion. Following is the satellite image of Lyari river as it flows from Sohrab Goth and falls into the Arabian Sea. I’ve marked the river and Expressway corridor in green. According to one study, Lyari river is the main contributor to an estimated amount of 200 million Imperial gallons (909.218 million litres) of raw sewage that enters the Arabian Sea. If you are one of those, who remember the haphazard channel of sewage filled Lyari River, then you will certainly appreciate following photos which show the channeling effort of Lyari River. Also note the flood control embankments being built on either side of the river. Historically Lyari river used to be a source of perennial water which flowed through it during rainy season. An unconfirmed source cites that until 1950s, the river held clean water and fish, with farming activities on its banks. Over the years it has become the largest sewage and rain water dump from all over the city of Karachi. In 1977 there were severe rains and flooding in the city and almost 200 people lost their lives because of Lyari river flooding. This was the first time that WAPDA planners thought of taming the river by building embankments on both sides and taming down the water channel. This plan was never implemented. Karachi also had a famous master plan released in 1975-76 and called Karachi Master Plan 1975-1985, which called for building a Northern and a Southern bypass to connect Karachi port with Super Highway (M9) and National Highway (N5) respectively. Actually Northern Bypass was proposed even earlier in 1973 as part of Karachi Development Program (1973-1985) as a semi ring road. In 1989, Lyari Expressway (32 km long) was proposed as an alternative to much longer Northern Bypass (57 km) . In 1993 there were severe floods in Lyari River again which made the planners think of a multipurpose project of Lyari expressway plus the flood control channeling of Lyari River. Following two photos show how dangerously close people used to live next to the non-flood water levels of Lyari river. Any rise in water level due to rains caused havoc in these localities. You can note a small wall in the photo to the left to keep water away but ofcourse this could never withstand a flash flood of monsoon season. In 1996, opposition from people during the public hearings let the provincial government drop plans for building Lyari Expressway as large number of people were to be dislocated. Northern Bypass was considered more effective because it passes through mostly uninhabited area. In June 2001, there was a change of heart and the government came up with the idea of building both the Northern Bypass (M10) and the Lyari Expressway together in the budget for the bypass alone. Northern Bypass (M10) is now complete and functional since August 2007. On September 1, 2007 it had the tragedy of a portion of falling flyover on the lower level road. By some estimates almost 250000 people are displaced as part of clearing-of-way for the Lyari Expressway project. Officially the construction of the Lyari Expressway required the demolition of 15,000 housing units and the displacement of 24,400 families living along the Lyari River. This is thought to be the largest urban demolition project for raod making in Pakistan. 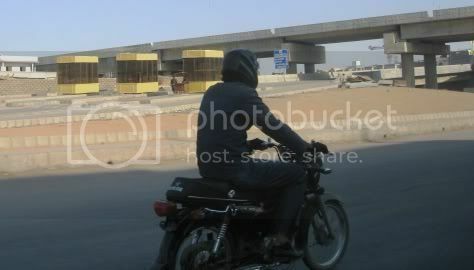 Following two photos show the demolition phase of Lyari Expressway Project. To resettle the displaced people, the government launched the Lyari Expressway Resettlement Project (LERP). As part of this project, people were given a compensation package that included an 80 square yard plot of land on the outskirts of Karachi and Rs 50,000 for construction. The lands were allotted in newly developed suburbs in Hawk’s Bay, Taiser Town and Baldia Town. Following Photo shows concrete pouring phase of Lyari Expressway Flyover bridge the Super Highway (M9) at Sohrab Goth. On a positive note, it moved people from unplanned localities at the banks of Lyari river and put them in planned localities with Schools, Parks, Utilties and for Karachi’s standards comparitively greener localities (with planned tree plantatation) but on a negative note, the 80 sq yard plots given to affectees are too small and may not be equivalent to what these people had to give-up. So there is definitely a social/human cost associated to this mega proect. The controversy surrounding Lyari Expressway was the subject of a 2002 short documentary film titled “The People vs. Lyari Expressway”. The film was written and directed by Maheen Zia and was screened at the Kara Film Festival in Karachi. Following is the image of the original master plan. 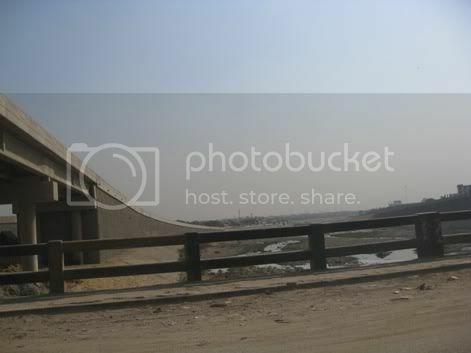 Following photo of Lyari Expressway is from August 16, 2008. 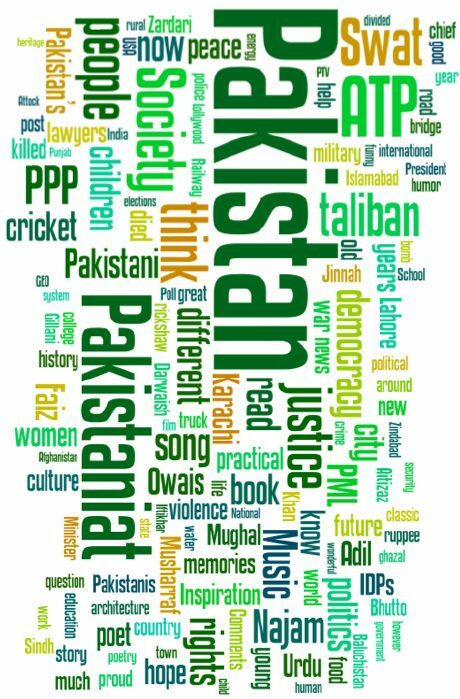 Photo credits belong to Faisal Rafiq. I took following photo on Dec 14th, 2009. It shows Lyari Expressway looking north from Sohrab Goth. Following photo was taken around Dec 20, 2009. It shows the ramp and toll booth to Lyari Expressway at Sir Suleman Shah Road Interchange. What About North Bound Lyari Expressway ? Not all encroachments have been removed from the North bound corridor of Lyari Expressway. After the encroachments are removed, Right of Way (RoW) needs to be given to National Highway Authority (NHA) which is responsible to finish the project. As written above, NHA’s website shows 59% work complete on North Bound lanes. 4. Lahore Rapid Mass Transit Rail Project. 2. National Highway Authority, Pakistan. 6. Lyari Expressway- A land scam? i want say …. lyari expressway new karachi town tak aana chahye. new karachi k logon ko bhi facility mil sake!!!! While Lyari expressway project has done a good job in channelizing the river lyari, not enough is done to stop people walking across it and using raw sewage for bathing. Following photo is from 3rd week of March 2010.